LifeHacker has a continuing series where where they feature someone's Go Bag. Most recently they featured a Lean Engineer's bag (I didn't even know such a title existed). To me, this makes for fun browsing. I keep meaning to contribute my own bag tour to their flickr group, but have yet to get around to it. After reading Devin over at GoRuck's bag breakdown (which includes such "essentials" as a flask of Whiskey and a collection of George Orwell's writings), I decided it was time for me to take some action. Notice what's missing? How about the bag. That's actually by design. See, unlike my Lean Engineer Friend or Devin over at GoRuck, the bag itself changes. If I'm taking a walk through the neighborhood, I'm probably using the Port and Company Sling bag. If I'm traveling, like I was a few weeks ago, I'm probably using the day pack attached the the REI Stratocruiser (a solid piece of travel luggage, by the way). If I'm going into DC and bringing heaps of camera gear, I'm probably using a larger knapsack that can accommodate it all. In other words, it's not about the bag. Also, modularity is key. If I'm going without a bag but wearing cargo shorts, I'll probably grab the Altoids Tin and Flip & Tumble bag, and do without the other items. So just what are you looking at above? PhotoJojo lenses - these tiny lenses let me grab fish eye and macro shots with cell phone. They help turn my cell phone camera into a device that doesn't just serve as a backup to my DSLR, but compliments it. Anker Astro 3E battery - the battery on my S5 is supposed to have great performance, but I still find that I can effortlessly drain it. Back when I had a Galaxy S3, it took only a few hours of heavy use to be at 50% or below. This battery saves the day every time. It's especially useful during travel, when the phone gets even more use. This is probably my most used item. Perixx 805L Keyboard - this keyboard turns my Galaxy S5 into a touch typing machine. Between remote shell access, Terminal IDE and text input capability, this basically turns my cell phone into a simple, yet usable laptop. It replaces the MiniSuite Bluetooth Keyboard I was carrying, which was functional but not quite as powerful as the Perixx. A Buff. In the winter, this serves as a balaclava for colds days. In the summer, I drench it and use it to keep my neck cool. While traveling I used this recently as an eye mask and a beanie (who knew it was going to be chilly in San Diego?!). Like any bandana, it's got hundreds of uses. Another Bag. this one is a Flip & Tumble, though I sometimes swap in Sea to Summit foldable backpack instead. Yes, I appreciate the irony of using a bag to carry around a bag. But, I find this guy gets a heck of a lot of use. After the battery above, it's probably my second most used item. Anytime we take a walk in the neighborhood, I find that we end up at the grocery store, pharmacy or library and I've got to haul stuff home. The bag works. 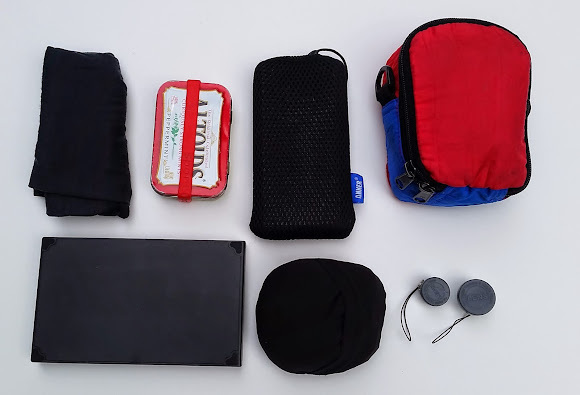 It's probably worth noting that what I'm describing above is much more in line with LifeHacker's Go Bag universe than what's traditionally called a Go Bag. A Go Bag is supposed to be what you grab when need to leave Right Now. Whereas LifeHacker tends to be more "what do you carry with you on a regular basis" (or EDC for those who know the lingo). The above items are designed mainly for life's first-world problems: being stuck on the tarmac and hoping my battery will stay alive long enough to finish my audio book, or using the macro lens to grab a photo of some curious looking insect. On the other hand, with some creativity, the items in the bag should be able to help me weather 24 hours pretty much in any location; from a Red Cross shelter to a night in the woods. So, comparing this to a fully stocked Go Bag, I'd call it a Go Bag Lite. To date, the headphones are probably my most frequently used item. A random silicone bracelet keeps the tin closed and is useful in its own right. A tube of peanut butter. Yum! This guy is essential. An USB wall charger. When combined with the cord from the Anker above, I can re-charged my cell phone or external battery at any outlet. It's a little bulky but power is so essential it's worth the trade off. Bic Mini Lighter - as a Boy Scout, I've got to be ready to start a fire at moment's notice. And who knows, maybe I can rig up a torch to fight off zombies. Actual last usage: lighting birthday candles. Athletic Tape - a veritable single-item first aid kit. packet of medicines: Pepto Bismol, Imodium, Advil, Benadryl, that sort of thing. When you need an Imodium, you *need* an Imodium. Small, but powerful stuff. Space Blanket - Lots of uses for this guy. So there you have it. It may not contain the 3 cutting implements that Devin's go bag has, the guns, ammo and cash Salt has in her bag, but all of the items above are TSA compliant and can be dropped into any bag I'm carrying. And I'm ready for anything. Like an extra long wait in the dentist's office or a surprise trip to the farmer's market. By the way, all this is on top of my usual pocket contents, which covers the essentials I truly don't want to be without. So, nu? What's in your bag? Do share a link to your bag's tour.